I recently finished reading the September Issue of Climbing Magazine, and came across a sweet article (written by Alli Rainey of allirainey.com). Someone had written in saying they climbed 5.11 but needed help getting their first 12a, and asked “What do I do to make the leap?”. What followed was a schedule of how to reach that next level. The article was great, but I wanted to make something a little more concrete and usable on a daily basis. Here’s a piece of the article! Climbing Magazine recently put the article online here: http://www.climbing.com/skill/your-goal-climb-512a/. Check it out! This is my first time making something like this and it is by no means perfect. Feel free to adapt it to what you like or gut it and start over. If you run into any issues or have any questions, feel free to contact me and I’ll do my best to help. Also, importantly, I am standing on the shoulders of Alli Rainey (writer) and Climbing Magazine (publisher) who published the original article, so by no means am I claiming the original idea is mine. I am referencing them in the doc and will never sell this, but just keep in mind that they’re the awesome ones and I’m just adding to it. That being said, you can go ahead and download the schedule (xlsx or xls) and follow along if you want. 1. First, write in the a) Starting Month, b) Starting Climbing Grade, and c) Goal Climbing Grade in the first sheet (Start Here!) in cells B8, B9, and B10, respectively. 2. The corresponding “Finishing Month” and V-scale grades for bouldering will be outputted, as well as an error message in case anything is wrong. 3. If all goes well, the rest of the schedule should automatically be filled in. There is one Sheet for each month in the schedule, and they are designed to be printed out and taken with you each month. It’s set up for someone climbing 3 days a week, but you can adapt it if need be. Each “Month” or Sheet starts off with a basic description of what you’re doing that month, followed by a couple items to remember every week. After that are the three sections. 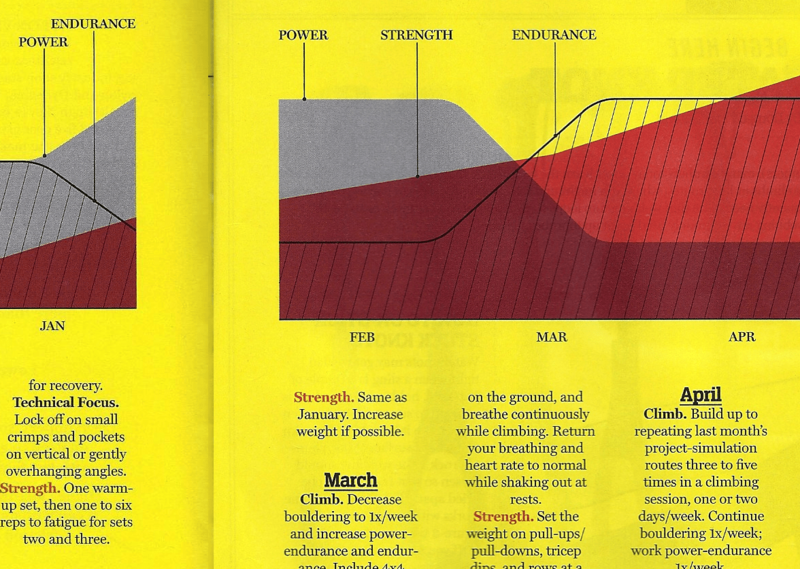 The first section in each sheet is called “Climb“, and it explains the kinds of climbing you will be doing each month. The second section is called “Technique“, explaining the technical focus of each month. The third and final section is called “Strength“, and will include a list of weight-lifting exercises to supplement your climbing. The Climb and Strength sections have mini-“schedules” in each, so you can plan out what you’re going to climb each day, as well as what you’re going to lift when you lift. You’ll be picking training techniques for each day of the week. B/R (pictured): Bouldering and routes, no specific technique needed. 4×4/R (pictured): 4x4s and routes. Your 4x4s will probably take a lot out of you, so supplement them with a couple routes after you’re done. HIE/B (pictured): High Intensity Endurance and bouldering. The HIE will take a lot out of you, so boulder some easier stuff at the end of the session. BO (not pictured): Bouldering only, for the whole night, but with no specific technique. Just climb some problems and have fun! RO (not pictured): Routes only, for the whole night. Once again, get worked but don’t forget to enjoy yourself! HIE (not pictured): Just HIE. This will be for when you’re getting close to sending your project. The Strength section has a similar mini-schedule, except you’ll be filling in your Weight/Reps for each workout. The types of workouts themselves have already been chosen. Here you’ll be filling in the Weight and Reps for each workout. In general, the schedule starts you out with 3 months of building a base of strength/power, jumps into 3 months of power exclusively, and ties them together with a final 3 months of power-endurance. This schedule, coupled with the technique “lessons” and weight training should enable you to break through that plateau and send your goal. Once you’ve filled in the first Sheet, print each “Month” out and decide on a schedule (what days you’ll climb and what days you’ll lift). One of the keys to this working is a consistent routine, so get that hammered down early. Then, each month, you’ll be filling in the “Climb” mini-schedule and the weight/reps part of the “Strength” section so you know exactly what you’re going to be doing each training day. 4x4s are when you climb 4 12- to 20-move boulder problems 4 times each with 1 to 5 minutes of rest between each climb. The High Intensity Endurance training is when you climb 3 to 7 routes with 20 to 25 pumpy moves to a resting hold. Shake out and recover, then climb for another 15 to 20 moves. Focus on holds and angles like those you’ll encounter on your project. Do your weight training right after climbing or the day after, just don’t climb to exhaustion and then try and lift. Rest two days between weight sessions. Most importantly, have fun. At the end of the day, you should feel accomplished no matter what you climbed or didn’t. That’s all I can think of for now. Might update this if anything else is brought to my attention. Enjoy yourself and I hope this helps! Go ahead and download the schedule (xlsx or xls) if you haven’t already! Thanks for reading–let me know if you like/hate it or if you have any questions! climb until mountains seem like pebbles cast seas of sand. Always the philosopher, Matt! I like it. I’ve been following Alli for over a year now and had the good fortune to spend a day outside with her and Kevin. I learned alot and they have helped me grow into a stronger climber. I have adapted their methods and I can say personally it has worked for me. I havent lead a 12 yet (b/c i havent sought it out), but i have hung draws on .11d….so im close, thanks to them. Very cool, Christie! I’m definitely a big fan of hers after reading this. Glad to hear her methods help! Very excited to test out this 9 month plan–I’m getting an error message when inputting my starting grade and goal grade. I just used the standard YDS 5.11 and 5.12 in the appropriate boxes, is this correct? Thanks for the help! Glad to hear it! Make sure you’re entering the letter grade as well–that should be it! Cheers! Hope you find it helpful.